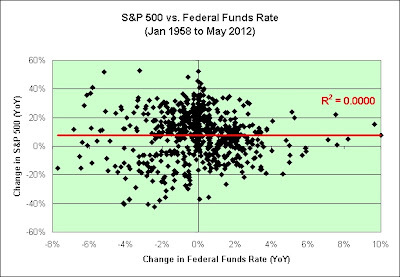 Do Not Fight the Fed! 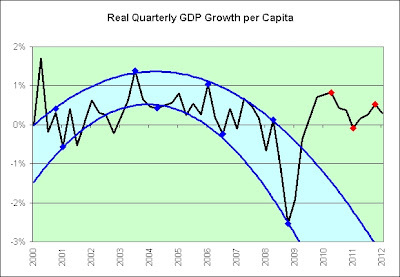 Coincidentally, the Economy Looks Great! I continue to climb at least 20 extra flights of stairs per day. I also continue to drink at least one extra glass of water. That's it. It takes about 4-5 minutes to do the bare minimum. It was a good month. Seasonal effects now appear to be offering a tailwind. I am satisfied with the long-term trend. I am 8 pounds lighter than I was a year ago. 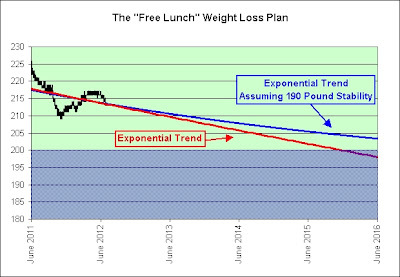 I have done nothing consciously to limit food intake. Hunger is not a part of this plan. The trend in red is a basic exponential trend line. It has a flaw though. I know for sure that my weight will not reach zero pounds. I will stabilize at a lower weight that is yet to be determined. 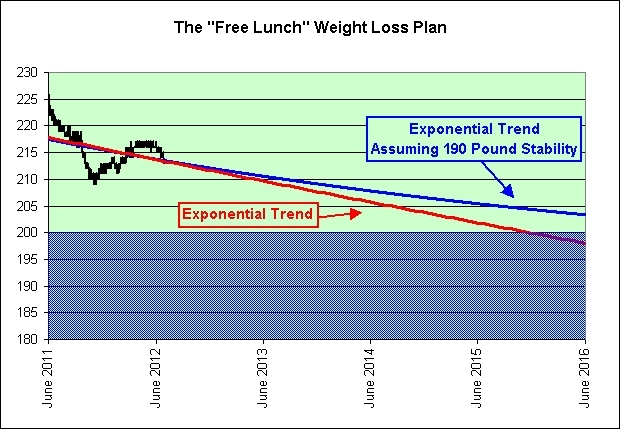 The trend in blue assumes that my weight will stabilize at 190 pounds. This is just a crude guess. I won't know for sure until more data comes in. 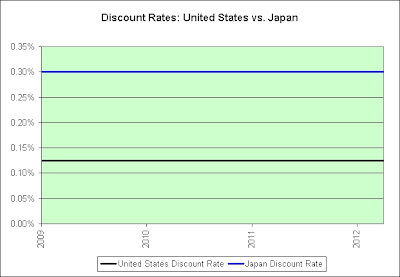 I tried to estimate it using the data I have so far. It's too noisy. The best fit was the one that said my weight was going to zero. I really don't think that's going to happen, lol. The following chart shows why the system is working and why I think it will continue to work. 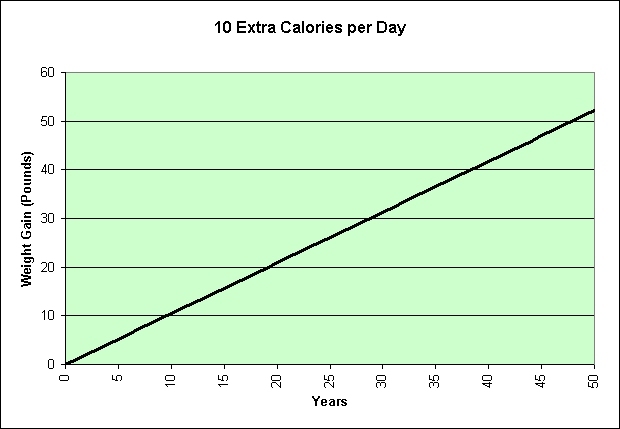 The chart shows what a 10 calories per day (equivalent to roughly 1/25th of a Twix candy bar) surplus does to a person's weight over time. The tiniest of changes in one's behavior can have huge effects over the long-term. By climbing 20 extra flights, I'm theoretically burning about 70 extra calories each day. I'm probably eating a bit more to compensate, but apparently not enough to matter. Further, by climbing the 20 extra flights of stairs per day I'm also more likely to want to do other things that burn calories. For example, last night I went on a 25 minute walk. The key here is that I wanted to do it. I did not feel obligated. 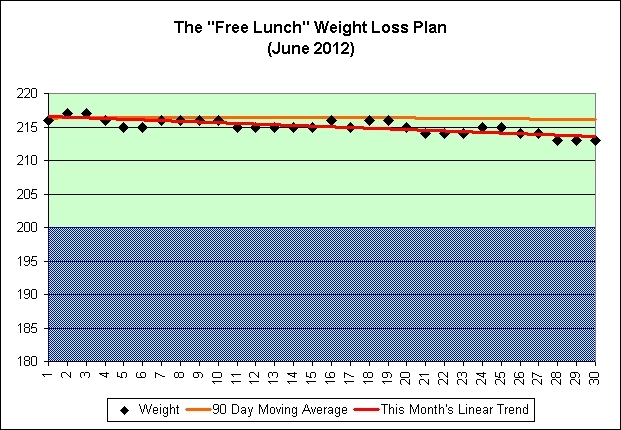 Last year, June was a good month for my personal weight loss. It is happening again this month. You will see that when I post the charts tomorrow. 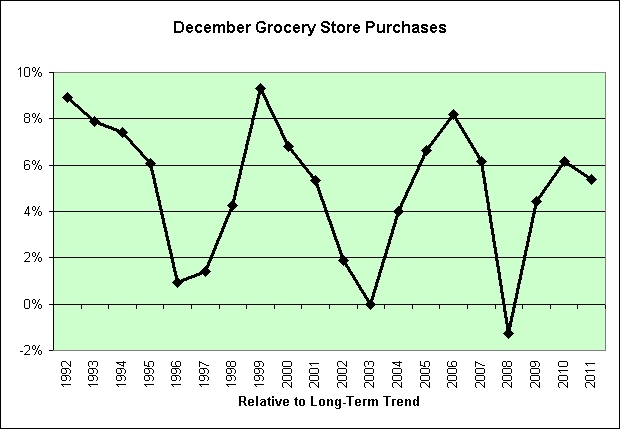 I was therefore curious which months we buy the most food. I started with the monthly grocery store sales as reported by the U.S. Census Bureau. I chose the data that was not seasonally adjusted since I am actually interested in seeing the seasonal patterns. 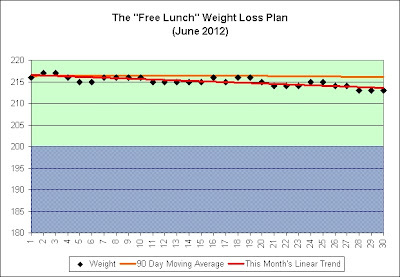 That monthly data was divided by the number of days in the each month (including leap days where needed). 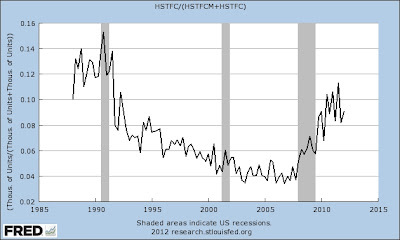 The inflation as seen in the "Food at Home" data series from the BLS (also not seasonally adjusted) was used to put it in today's dollars. 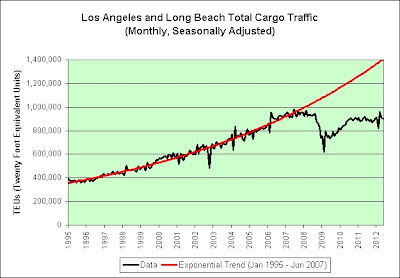 The total was divided by the reported population during that month. 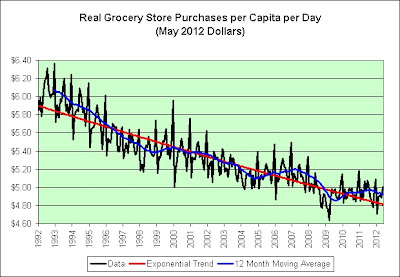 I think the overall downward trend can be explained by the growth of wholesale food retailers like Costco and Sam's Club. That's certainly where I do the bulk of my food buying these days. There are other factors that are important too. I know people are eating out more in general than they once were. 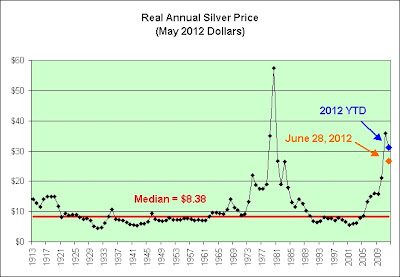 Although I find this chart interesting, I actually made the chart to create the following one. 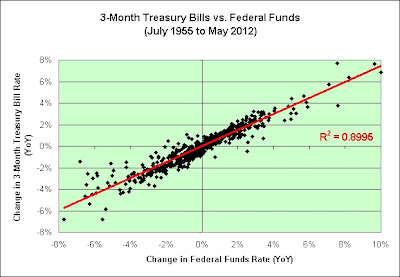 This chart shows how much a given month is generally above or below the trend line in the first chart. As seen here, there are strong seasonal effects when it comes to food purchases. December is a big month and January we must be eating leftovers. That makes sense. May, June, and July are looking like the BBQ months. That makes sense too. 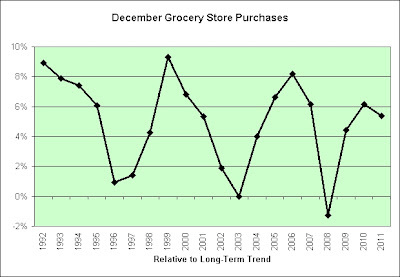 And lastly, here's a chart showing December grocery store sales relative to the long-term declining exponential trend. 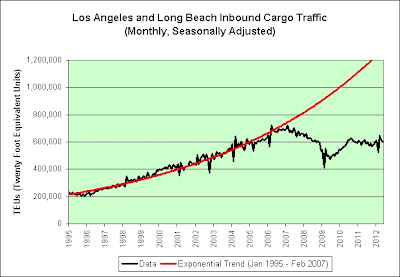 As seen in the chart, December 2008 was actually 1.28% below the typical month's trend. Ouch. I have a very uneasy feeling that we'll be getting a repeat at some point. It could happen this year. It could take a few years. Who knows? 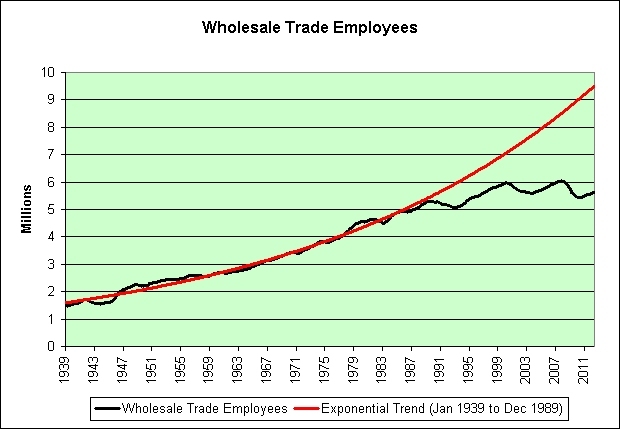 We've passed the peak and the trend has never reversed once that's happened (since 1992 anyway). Maybe this will be a first, but I'm not exactly bracing for the perfect pudding. Let's just put it that way. 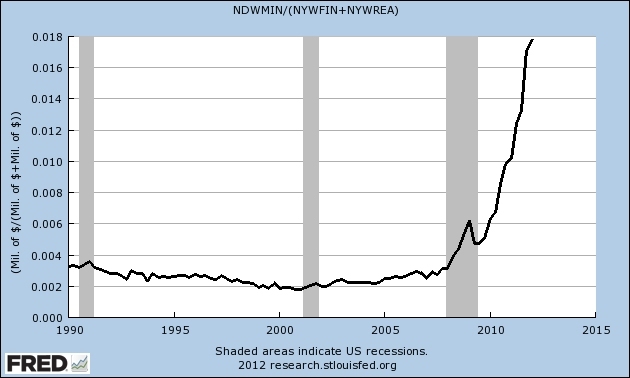 We got the blue zone in the aftermath of the dotcom bubble. 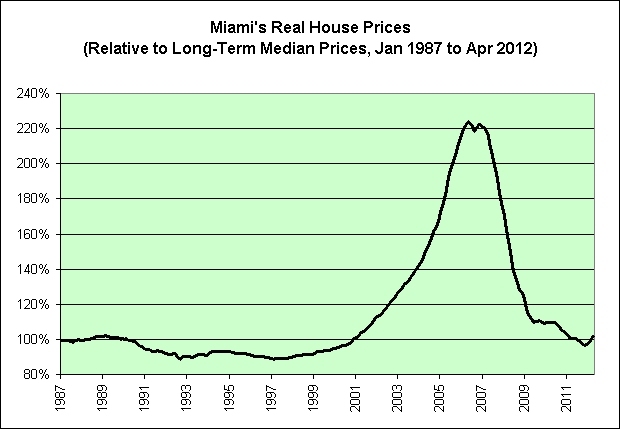 One wonders what the red zone will look like in the aftermath of the housing bubble. Robots take over put-away and storage – Workers merely insert bins into the storage cube via one or more receiving stations, at which time the robots take over for the actual put-away work resulting in major time savings. The following chart shows total North Dakota mining wages and salaries divided by New York FIRE economy wages and salaries. 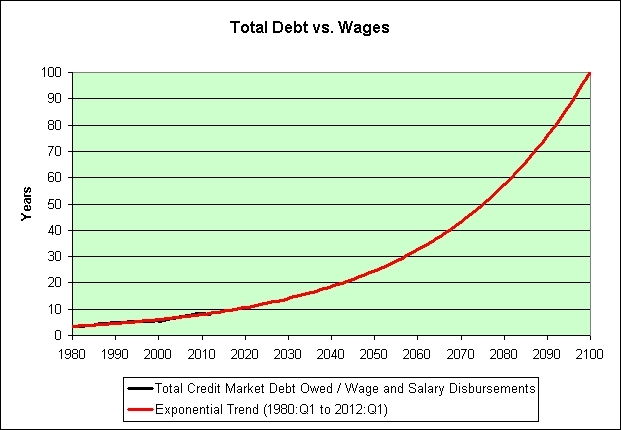 It has gone parabolic. One wonders how long it will last. Imagine you live in a small rural town worried for years about depopulation, and suddenly, overnight, the population doubles, and the newcomers are thousands of young men without families. Imagine that you live in a tiny town with one main street that doubles as a state highway. That's the situation in New Town, N.D., population 1,500 — at least, it was a couple of years ago. Today it's anybody's guess how many people live here, and no one knows how many 18-wheelers roll through every day, either. They just know it never stops. 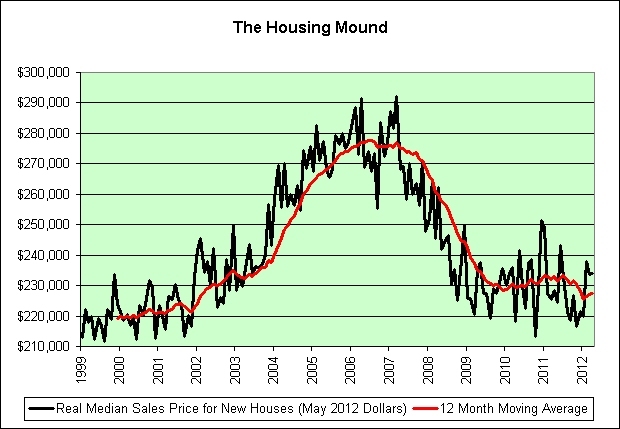 The moving average is sitting right on the long-term median. 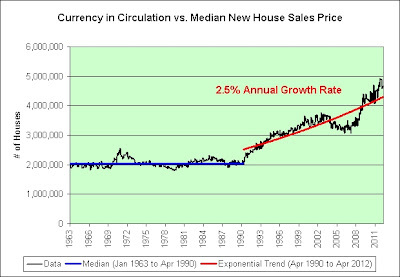 The current price is well below the long-term median. 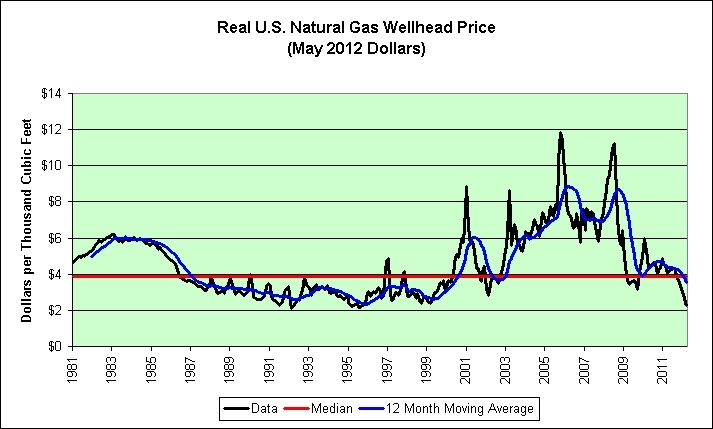 If I could hoard natural gas at the wellhead, I'd certainly be tempted to do it now. 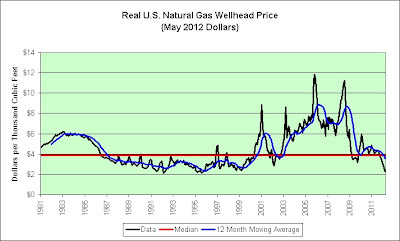 If history is any indicator, natural gas at the wellhead is currently priced for the bargain bin. 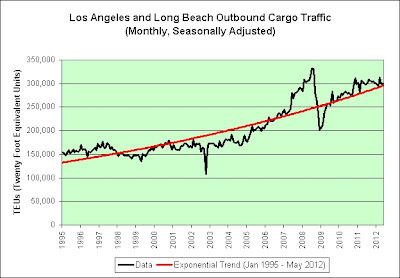 Once again, the moving average is sitting right on the long-term median. 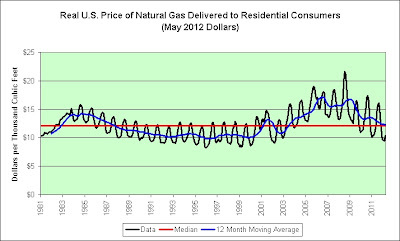 The current price, accounting for obvious seasonal effects, also appears to be sitting right on the long-term median. 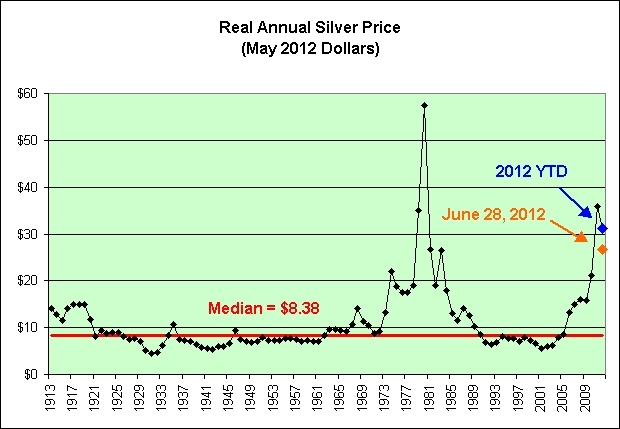 And lastly, why does anyone believe the inflation data and/or inflation predictions coming out of shadowstats? 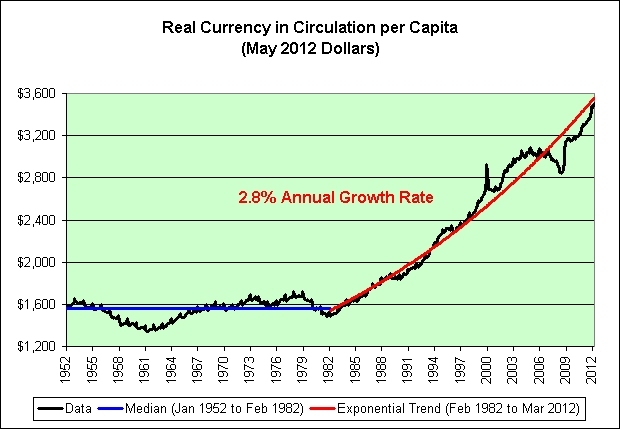 Where is the hyperinflation? 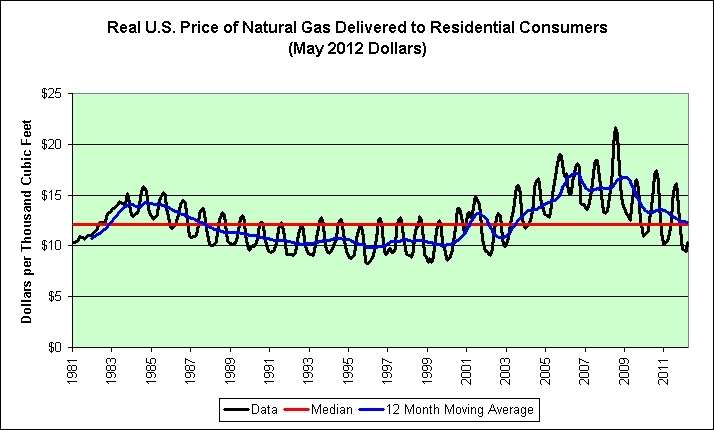 Credit Bubble Stocks: "Exxon CEO says low US natgas prices not sustainable"
Steuerle points out that it is wrong to assume this level will remain, and he notes that when "recessionary spending" ends, the overall government expenditures-to-GDP ratio is likely to drop. 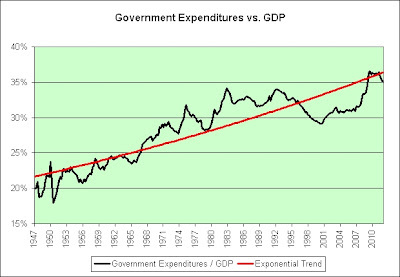 So I guess it would also be wrong to assume that we won't be returning to the long-term exponential trend line in red. As a side note, perhaps he did not get the memo. 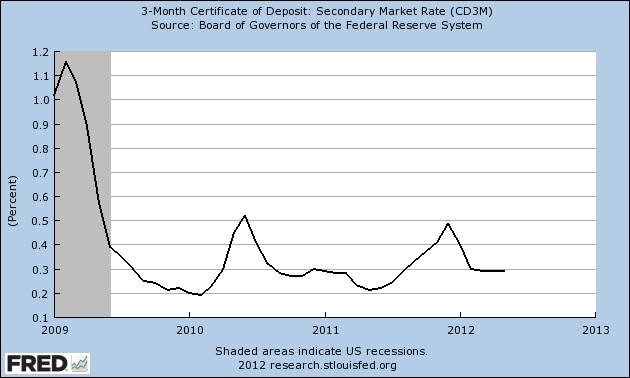 It's been THREE FULL YEARS since we exited the recession. What will government spending look like when we enter the next one? 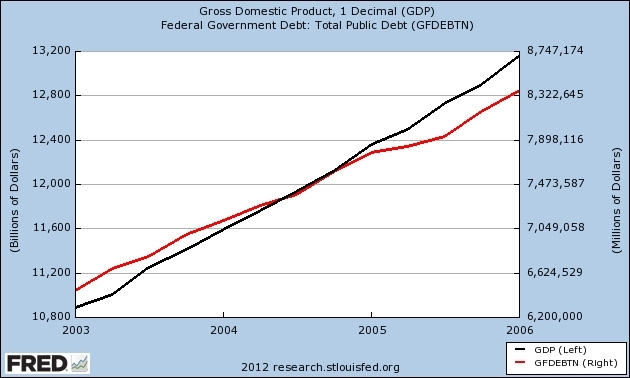 Eugene Steuerle is an economist with the Urban Institute. In sharp contrast, I'm just an anonymous blogger on the Internet with rudimentary information gathering and charting skills. What do I know? I can say this. Unlike most, I don't have much of a political agenda. I believe Obama is paving us a road to hell with good intentions. I think Romney will fly us there personally. Why, oh why, didn't we pick Ross Perot? First-time buyers are running into tough opponents in cash buyers. 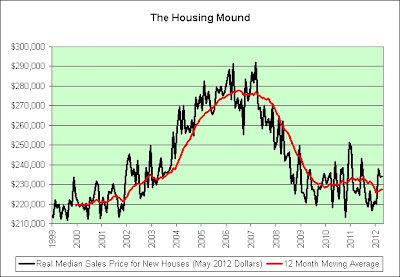 They accounted for almost a third of existing home sales in March and April, the National Association of Realtors says. 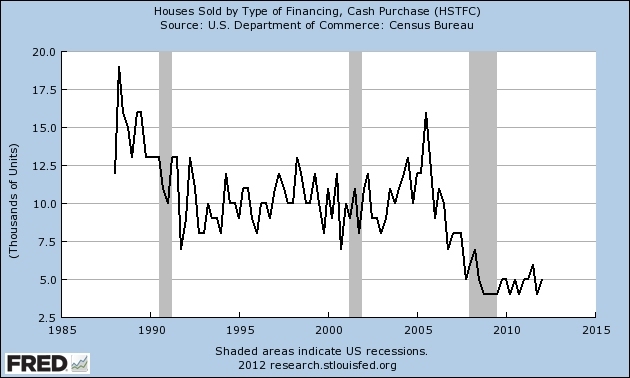 Before the housing crash, cash buyers accounted for less than 10% of sales, NAR says. 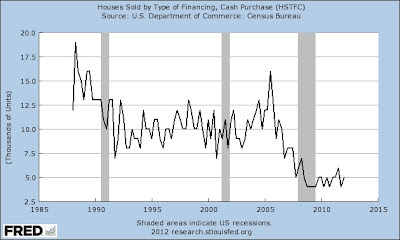 The following chart shows homes bought with cash as reported by the Census Bureau. 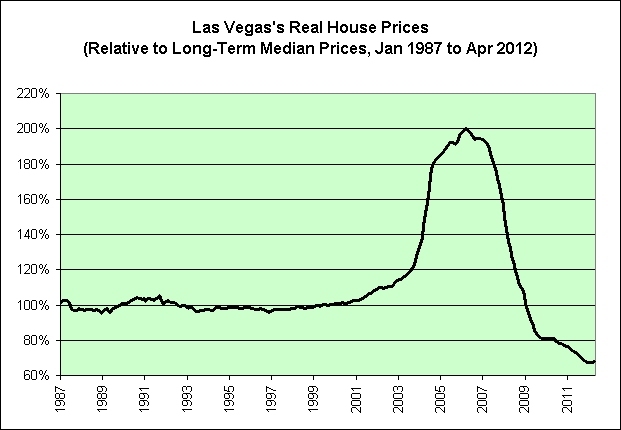 Note that there were 5,000 such homes in the first quarter (roughly 100 per state on average). This is well below the levels seen before the crisis hit. 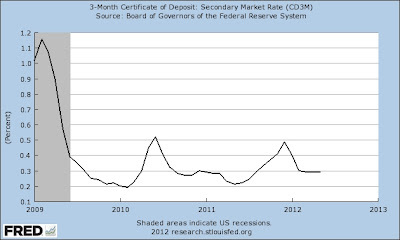 How can anyone spin that bearish data into something positive? Not a problem. It only requires 2 easy steps! Find an even more bearish chart showing houses bought with conventional mortgages. 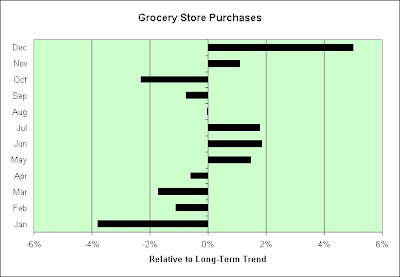 Chart the cash purchases as a percentage of the the combination. 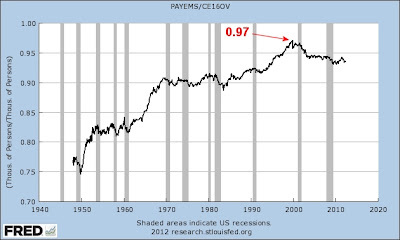 Mega-Monster cash rally! Sunday! Sunday! Sunday! Lock up the children! This ain't no mama's boy Sunday picnic! We're turning this country into a giant dust bowl!! I hope I'm not giving all my trade secrets away. 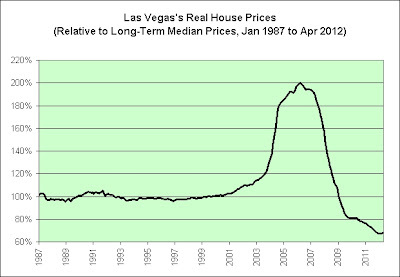 I don't want to ruin my chances at becoming the next Chief Economist at the National Association of Realtors. David Lereah and Lawrence Yun are my heroes! Let's extrapolate that out to the year 2100. The Treasury is planning to take advantage of Britain's historically low interest rates by taking out loans which will not be repaid for 100 years or more. 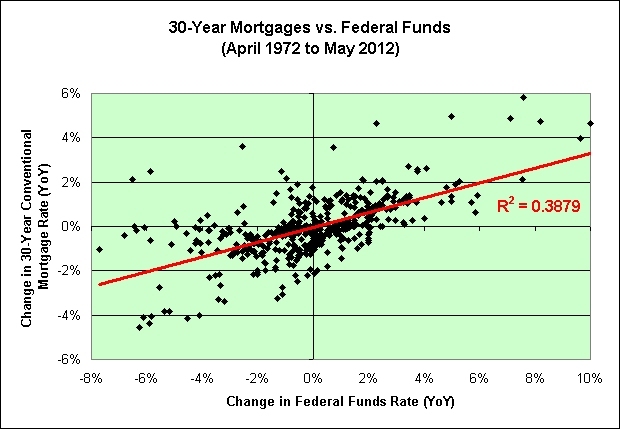 There's definitely a correlation between mortgage rates and the Federal funds rate. 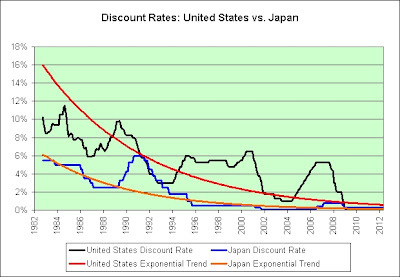 However, correlation does not prove causation. Let's dig further. Look at that. Mortgages are even *more* tied to 3-month Treasury bills. The correlation has gone up. 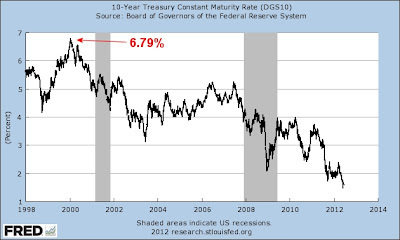 It's almost like the Treasury market overall is smarter than the Fed. Who would have guessed? This thought process begs the next chart. There is an extremely high correlation between the 3-month Treasury bill rate and the Federal funds rate. It isn't perfect though. Why is that? In my opinion, it is because a small group of detached people sitting within a closed room inside an ivory tower can do some incredibly stupid things if they put their minds to it. This is just a theory of course. From the 19th century it has been used to designate a world or atmosphere where intellectuals engage in pursuits that are disconnected from the practical concerns of everyday life. As such, it usually carries pejorative connotations of a wilful disconnect from the everyday world; esoteric, over-specialized, or even useless research; and academic elitism, if not outright condescension. 0.0000? Seriously? Could there be any less correlation? 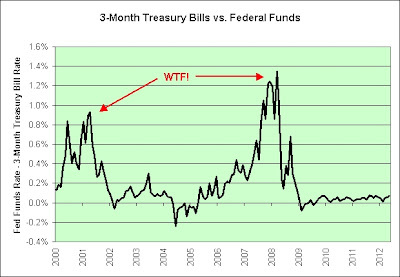 If you do fight the Fed then know this. Extremely random things are likely to happen! Whenever someone is offering someone else an obscene amount of money for whatever reason, it will always be in the form of neatly stacked and bound stacks of bills in a briefcase, or, if the amount is even larger, a suitcase. Always. Glendale police officers and their dogs are tracking at least three burglary suspects who allegedly kicked in the window of a Bentley and stole a briefcase full of cash, police said. $1.1 trillion would fill a lot of briefcases. 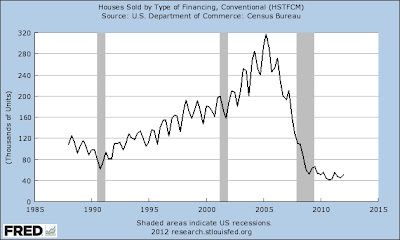 As seen in the following chart, that money could also buy 4.7 million new homes. 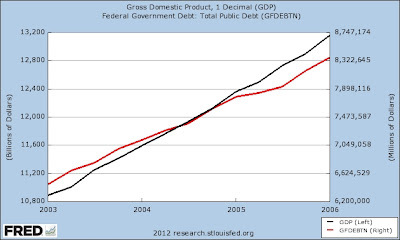 Remember all that money we sent to China in exchange for cheap goods to fill our landfills? Some of it is finally coming back. Woohoo! 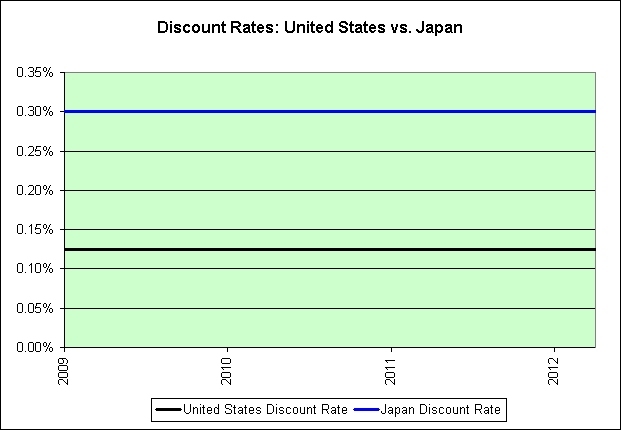 Would you believe that Japan's discount rate is more than twice as high as ours? Yeah, it's a whopping 0.3% vs. our 0.125%! What? Don't believe me? Okay, I'll zoom in on the most recent years. 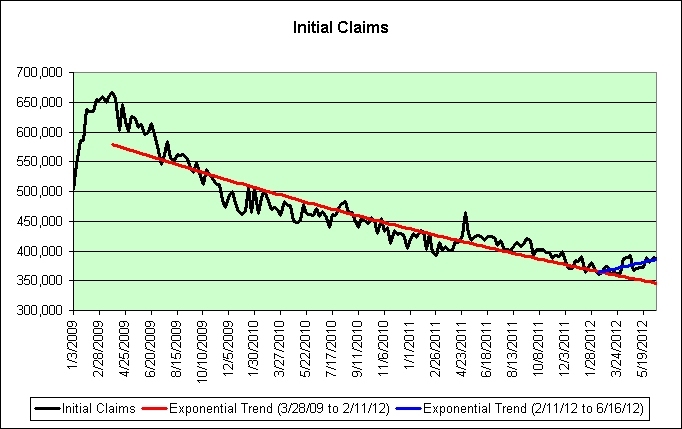 Note that I'll be removing the trend lines for reasons that will soon become obvious. 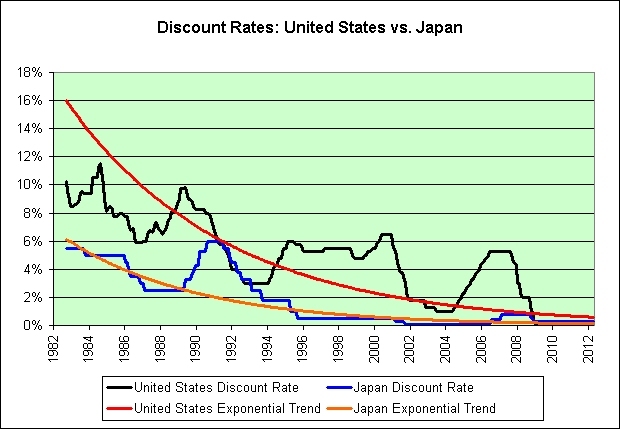 There's no way we can slide into Japan's never-ending financial mess. We are worlds apart! Disposable income is total personal income minus personal current taxes. 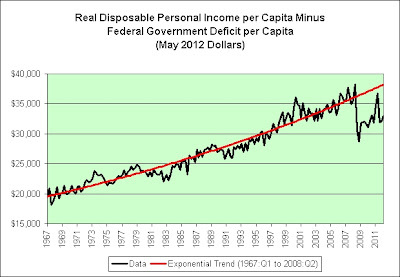 If it is truly our goal to maximize real disposable income then we should set all taxes to zero and keep them there permanently. Think how much money everyone would have! Need a $12.3 billion USS Gerald R. Ford? Borrow it! 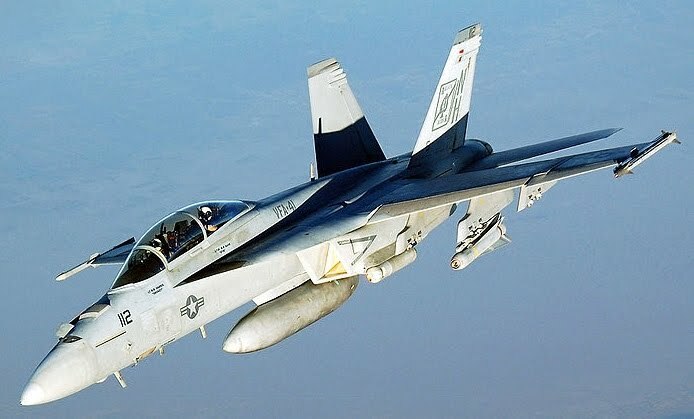 Need to fill it with $66.9 million Boeing F/A-18E/F Super Hornets? Borrow it! 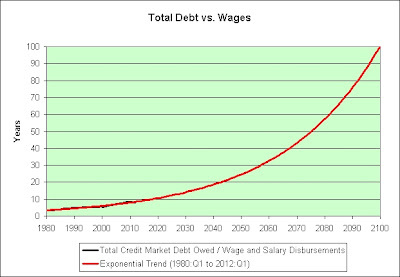 Need to haggle over $700 billion in food stamps over the next decade? Borrow it! 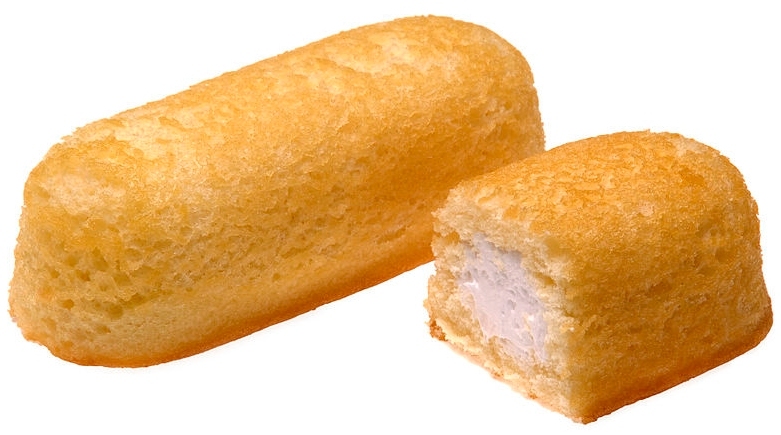 Need to pay unemployment for up to 18,000 Hostess employees (May 7, 2012)? Borrow it! Genius! Why hasn't anyone ever thought of this before? A friend sent me the following link today. 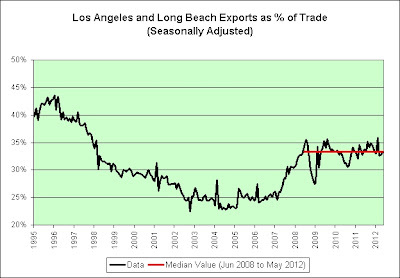 Imports have been mostly flat since I turned bearish in 2004. 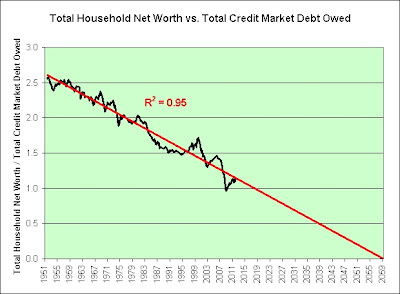 I'm not much of a gambler, but I would bet all that I own that we will never return to the red trend line. 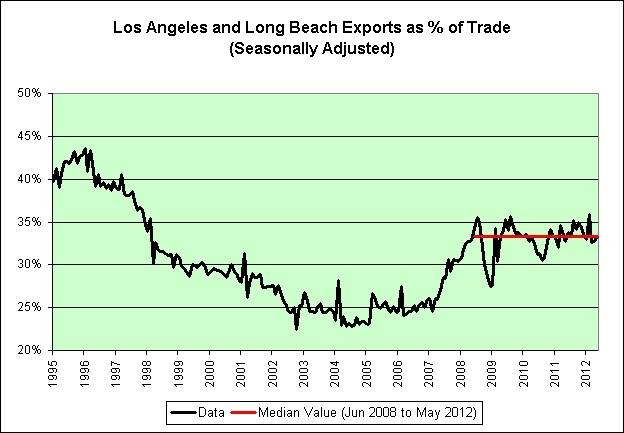 Exports have been flat for well over a year and are below their 2008 peak. 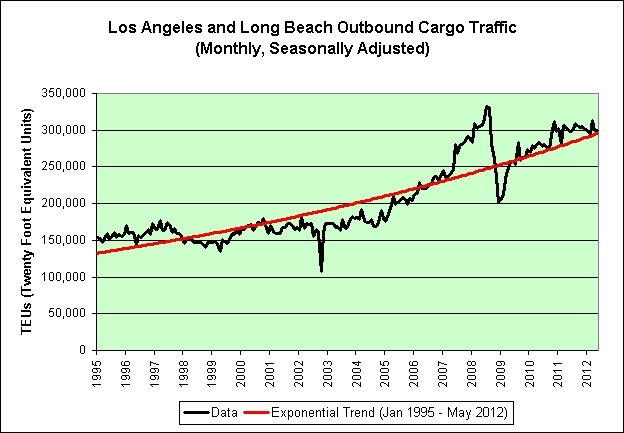 Overall port traffic has been mostly flat for the last 6 years. 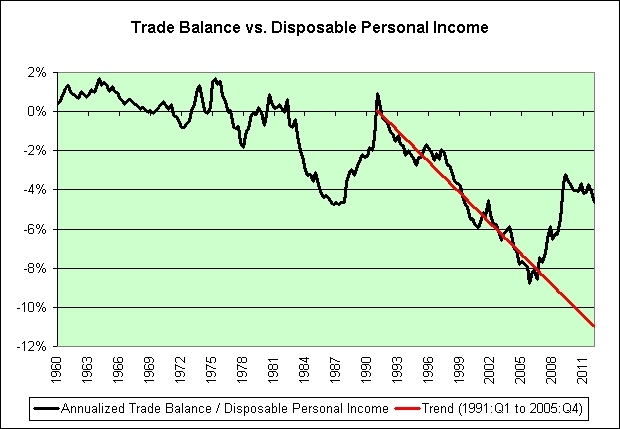 There's been no improvement in the balance of trade over the last 4 years. 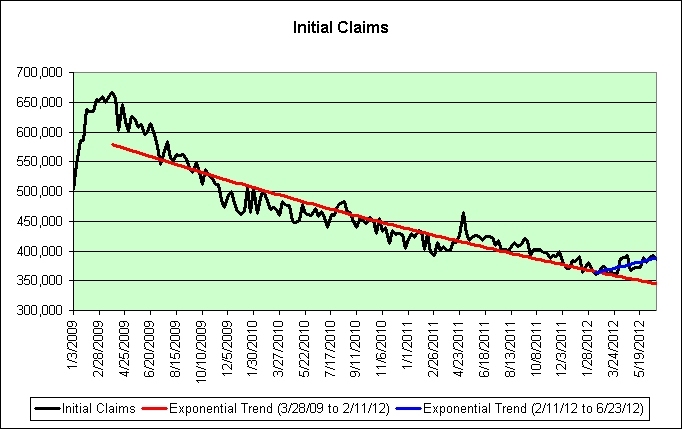 Initial unemployment claims fell by 2,000 to 387,000 last week. The four-week moving average rose 3,500 to 386,250, the highest level in six months. The weak data stoked fears about the strength of the labor market. It is typically used when Homer injures himself, realizes that he has done something stupid, or when something bad has happened or is about to happen to him. 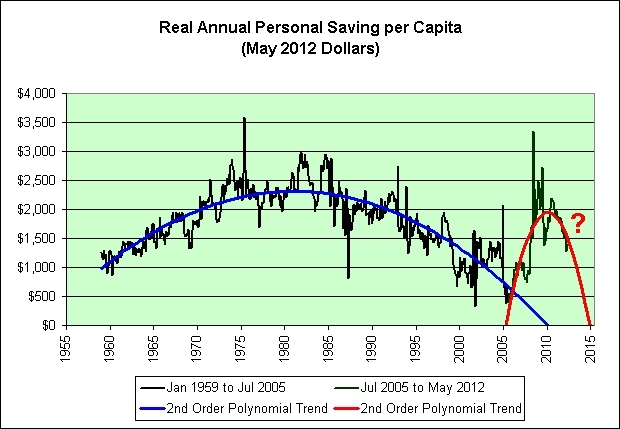 I have removed the area in yellow from the red trend line. 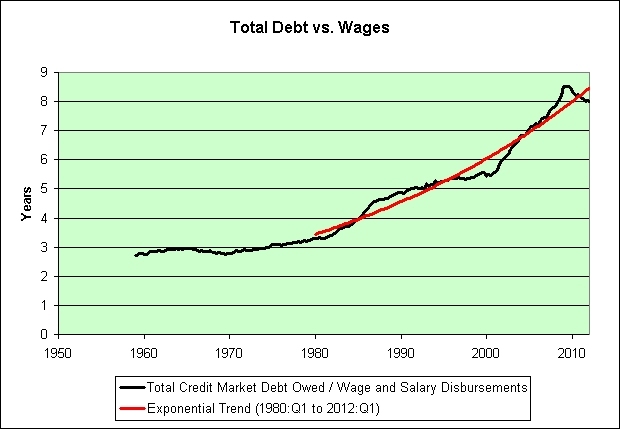 Other than the massive debt and sluggish growth that remains, it is almost like that era never happened. Woohoo. 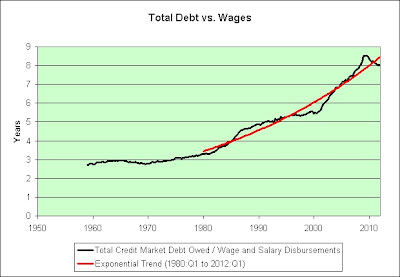 Now that I've done that, we all better hope that the red trend line doesn't continue. The following chart shows a similar trend line that better not continue, although much of the damage has already been done. In our NAFTA and WTO debates, advocates of so-called free trade promised us a rising standard of living, balanced trade and millions of good new jobs. Instead, U.S. companies shifted 2.4 million jobs abroad, while eliminating 2.9 million jobs in America. 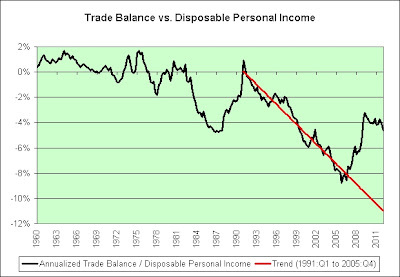 Our cumulative trade deficit since NAFTA is over $7 trillion. Our economy is de-industrializing, and we are losing strategic opportunities to produce the next generations of products. These are fundamental flaws in our trade policy that lower our standard of living -- well worth a serious public discussion. Nineteenth century "free trade" theory may work well in a textbook, but it has profound conceptual, economic, social, environmental, and political shortcomings in our real 21st century global economy. 1. Start with the percentage of homeowners who own their homes free and clear. As seen in the table, there are 76.4 million homeowners and 24.2 million own their homes free and clear. 2. 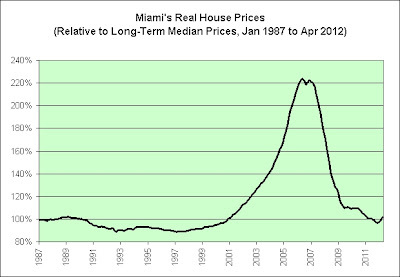 Now look at total real estate value. 3. 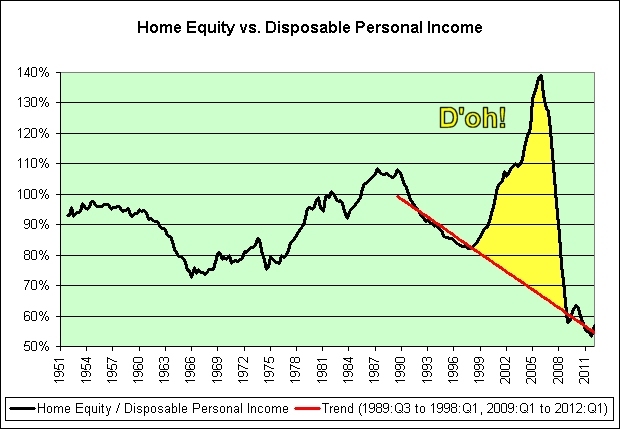 We can now crudely estimate the home equity of those who own their homes free and clear. This is just a ballpark estimate since we don't know the actual asset distribution (for example, it is possible that inexpensive homes are more likely to be paid off). 4. 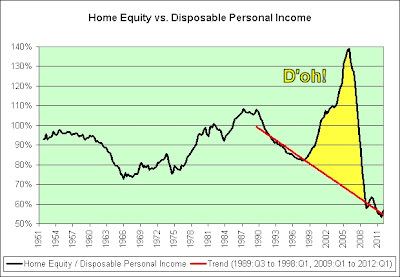 Now look at at home equity overall. 5. Now take the home equity overall and subtract the estimate for those who own their homes free and clear. The remainder shows the total home equity for those with mortgages. 6. And lastly, we'll go back to the first link and see that there are 52.2 million homeowners who do not own their homes free and clear. 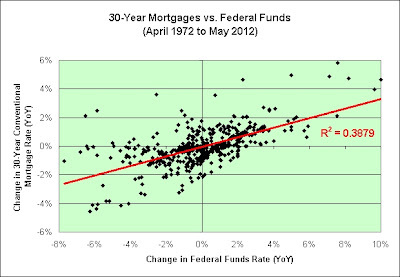 Using crude ballpark estimate math, what is the average home equity for owners who have a mortgage? 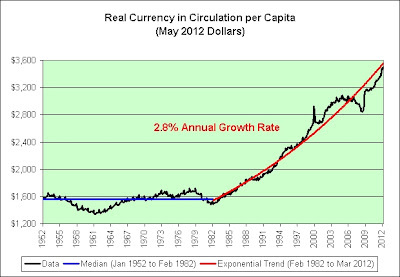 The rate of MEW has been linked to Marginal propensity to consume (MPC), as measured by Personal Consumption Expenditure (PCE). 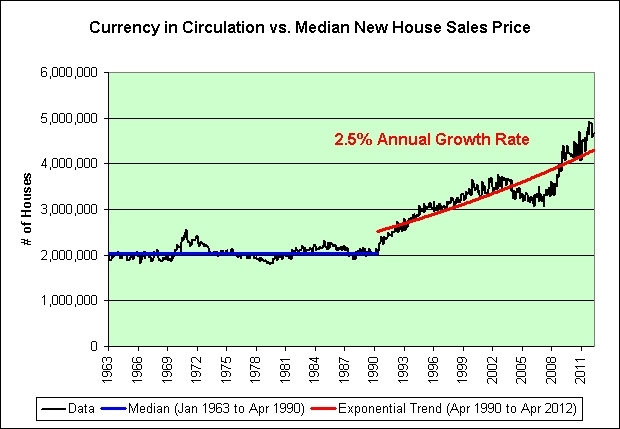 In the United States, during the dramatic rise in house prices MEW funded PCE 1.1 to 1.7% from 1991 to 2000, and almost 3% from 2000 to 2005 and was responsible for more than 75% of GDP growth from 2003 to 2006. 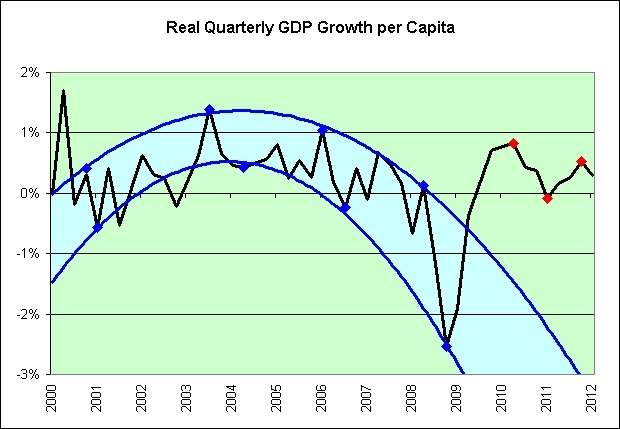 Are you wondering where the remaining GDP growth came from? In my opinion, we borrowed it too. We borrowed all we could and all I got was this lousy t-shirt! What lies buried under this mound? The world must never know! 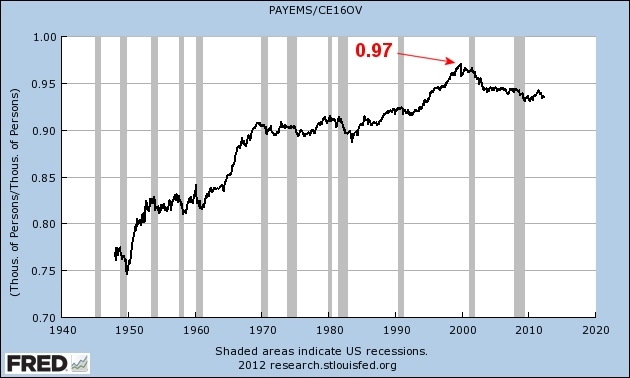 The following chart shows nonfarm payrolls as a fraction of civilian employment. As of 2000, "The Man" has apparently lost interest. I was sent the following link through a private email today. 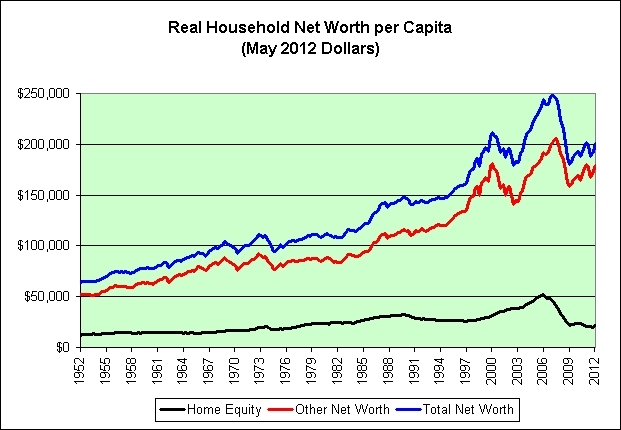 Overall, median household net worth declined 35% to $66,740 in 2010. 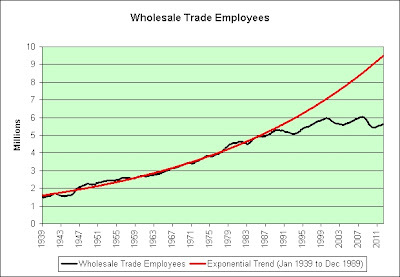 Now check out the following chart. 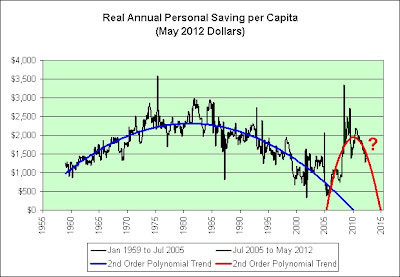 Note that the average real net worth per capita (as seen in the chart as the blue line) is roughly 3x more than the median real net worth per capita (as seen in the article). Apparently the wealth does not trickle down all that much. Who knew? For most Americans, a home becomes the largest investment in their portfolio. Ridiculously large. After all, how many people with a $100,000 home also own $900,000 worth of stocks (meaning the home is a reasonable 10% of their entire portfolio)? 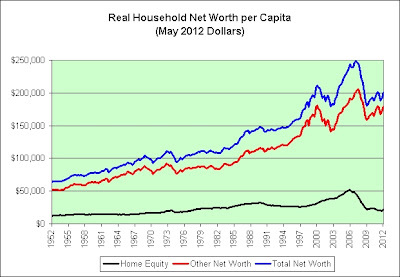 As seen in the chart above, the "average" person has almost exactly 10% of their net worth in their home. That said, I would agree that most don't. The "average" person isn't at all typical. We don't all have a little bit of billionaire within us screaming to get out. If you can convince yourself to get over this mental hurdle and instead rent a home, then invest extra money in the market's best stocks. You'll be wealthier, freer, and happier in 30 years. That strategy definitely worked great in the last century. For a variety of reasons, I have a serious concern that it won't extrapolate forward well though. That's why I would recommend the following to boost your chances. 1. Invent a time machine. 2. Travel 30 years into the future. 3. Write down the best performing stocks over the past 30 years. 4. Travel back in time to the present. 5. Invest in the market's best stocks! And as a side note, I do not expect to be "freer" in 30 years. I don't know what to do about that. Are there any companies offering Patriot Act insurance? The commissioners routinely had been writing off old fines after the four-year statute of limitations on those cases expired, but on Friday they decided they'd had enough, noting many on the list are still in office or in state or local government jobs. New apps are making age-defying photo airbrushing techniques once reserved for celebrity magazine covers available instantly and inexpensively to just about anyone. Work in the warehouse is physical, with many employees walking more than 10 miles per shift plucking items from shelves. Workers said those who didn’t move at a sufficient pace faced termination. They said quotas were not reduced when temperatures soared. Pursuing greater efficiencies, Amazon in March bought Kiva Systems Inc., a robot manufacturer, for $775 million. Kiva, founded in 2003 and backed by, among others, Bain Capital Ventures, claims that three to four times as many orders per hour can be packed up by a worker using its robots. For Bezos the Martian, the human factor is pesky. Now a more automated solution looms. 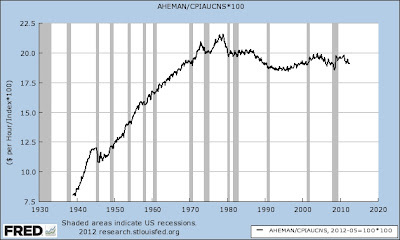 The following chart shows the inflation adjusted average hourly earnings of production and nonsupervisory manufacturing employees (May 2012 dollars). 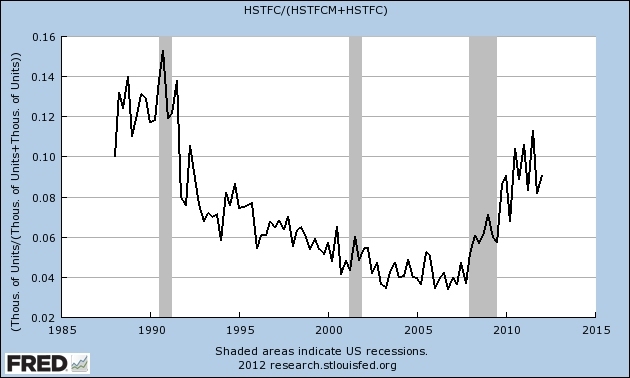 Real hourly earnings are currently 12% below the peak hit in December of 1978. 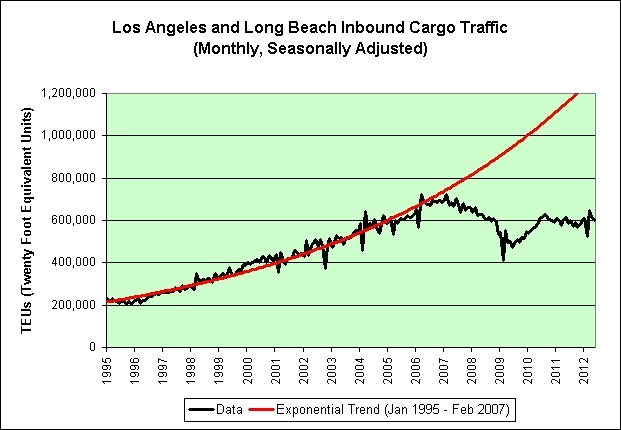 It's looking to be quite a year if the long-term trend continues. 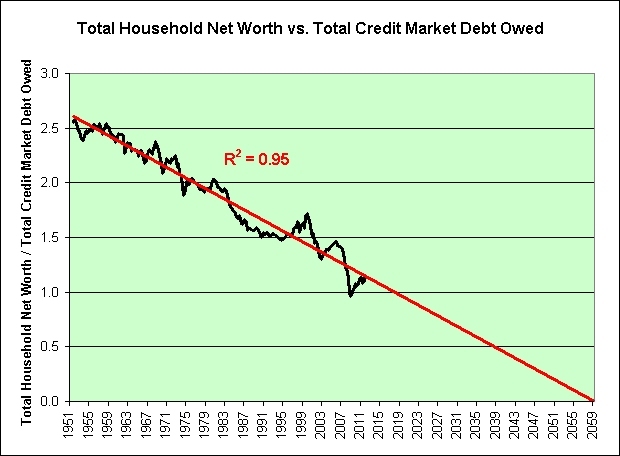 We'll have zero net worth and/or infinite debt.